This title is a revision of Experimental Thermodynamics Volume II, published in 1975, reflecting the significant technological developments and new methods introduced into the study of measurement of thermodynamic quantities. 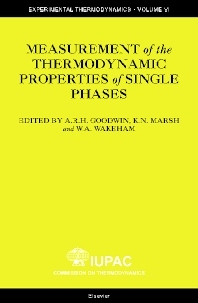 The editors of this volume were assigned the task of assembling an international team of distinguished experimentalists, to describe the current state of development of the techniques of measurement of the thermodynamic quantities of single phases. The resulting volume admirably fulfils this brief and contains a valuable summary of a large variety of experimental techniques applicable over a wide range of thermodynamic states with an emphasis on the precision and accuracy of the results obtained. Those interested in the art of measurements, and in particular engaged in the measurement of thermodynamic properties, will find this material invaluable for the guidance it provides towards the development of new and more accurate techniques.